Main Street Galleria opened its doors in October, 2008. It started as a way to help revitalize the small rural town of Hoffman, MN. We're an incubater mall with over 25 unique vendors; each bringing exceptional products and charm to the store. 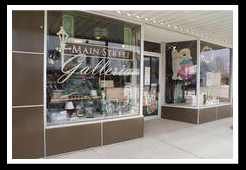 If you're looking for gifts or products that are one-of-a-kind, hand made or just plain fun...you need to visit Main Street Galleria. Let us delight you with our small town service!